Louie and Kathi's Hidden Garden. All photos by Frank Gormlie, who apologies as some of the pics were washed out. Editor: We repost this in tribute to Lou Williams who has just passed away. There will be a celebration of his life on Wed., December 1, at Beardley-Mitch ell Funeral Home, 1818 Sunset Cliffs Blvd. from 6 to 8 p.m.
“This whole place was the pits,” says Louie Williams, gesturing at the lush, artfully designed garden around us. Louie - a very friendly guy with always a smile - here the sun is in his face. It’s hard to believe, but Louie swears that it’s true, pointing out spots where he had trees taken out, pulled up overgrown bushes. When he moved to this little house on Niagara with his wife Kathi, one of their first projects was to tear up everything in the garden, down to the last blade of grass, and start fresh. The result is a phenomenal work of art. Louie gives me a tour of the garden, pointing out where he’s attached a door and a window to the back of his tenants garage to make it look like another cottage. There’s also the little hillock on which they’ve created a miniature oriental scene, complete with small Japanese figurines, bonsai trees, and pieces of glass to simulate lakes. Various antiques, too many to count, peer artfully from beneath or behind plants. The most prevalent items are windows, several of them, old and peeling, hanging up on the fence that separates the yards. Louie and Kathi replaced the glass in the windows with mirrors, which enhances the space while also giving it an eerie, fairy-garden quality. Someone is always watching you here, even if it’s just your own reflection. Louie has a different take, as he points out the mirrors, exclaiming how much they contribute to the space. He steps back and looks at them proudly. Small and wizened, with gray hair and the sweet face of an Italian grocer, Louie looks up at me and cackles, then hustles me back to the back of the garden to show me some more antiques, donated by friends and store-owners in the area. As I am led around, I marvel. What is truly remarkable about the garden is the attention to form. 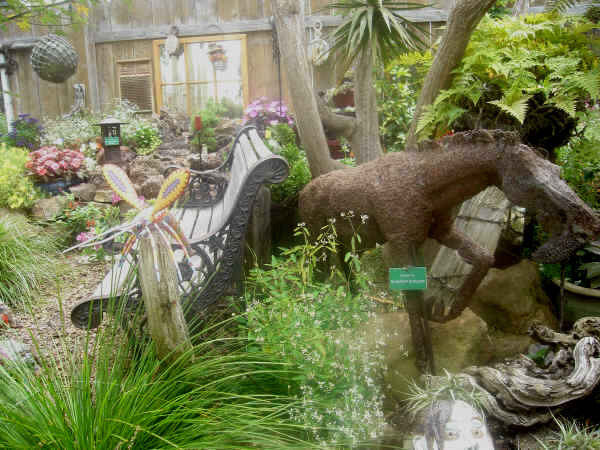 The garden that Louie and Kathi have created shows an artist’s eye for creating vignettes, surprises, and hidden treasures without any appearance of clutter or schmaltz. There is order here, even a peace. Perhaps this is the true attraction of this hidden garden. From the front, the yard looks interesting and eclectic, sure, but once you go around the front house, where renters live, and into the back, another world opens up. Louie and Kathi, over the years, have gotten used to people, many of them strangers, wandering back and spending time in the garden, just sitting, or smelling, or, if they’re kids, getting deeply involved in intricate playacting. The Williams encourage visitors, and have several “regulars” to the garden. Louie points at a rubber tarantula in one of the plants, and explains that one man comes through with his two kids about once a week, and one day his little boy brought in a tarantula to donate. Louie made sure to put it in a pot he’d remember, so he wouldn’t give himself a heart attack later while gardening. Louie and Kathi’s world seems anything but sad, full of the mysteries of the garden and antiques, and the excitement of new and old visitors alike. When I ask if he’s ever caught teenagers making out in the garden (there is definitely something romantic about the place, and hey, it is hidden), he chuckles and says no, but he did walk out of his house one day around lunchtime and there was a young couple sitting in the garden having a picnic. He politely excused himself and went on his way, leaving them to their date. Louie and Kathi themselves met, married and moved to Ocean Beach only about 7 years ago. Louie was an antiques dealer in Lemon Grove, and Kathi came in to his store and they started talking. “I was by myself for 12-13 years, and was kinda set in my own ways, but we just kinda hit it off,” says Louie shyly, changing subjects quickly to his antique business. He hurries into the house and back out with a big set of keys, and opens the back garage door, shedding light on a veritable grandmothers attic of antiques, trinkets that could absorb an interested collector for hours. He dismisses it with a wave, and says he’s selling it bit by bit at garage sales he has about once a month. I marvel at an old filigree and turquoise bracelet, before remembering my empty wallet and putting it down. Back out in the garden, I can see how Louie and Kathi’s shared passions for antiques, plants, and art coalesced into the garden I see before me. Although we’re just a block away, it feels like Newport and tourists and the bar scene are miles from here. A swarm of contented bees buzz around an African Basil bush, unknowingly stalked by a lithe calico kitten named Lola. A sea breeze rustles in the leaves overhead. And as I look across, I see reflected in one of the windows a smiling older man, tenderly bending to examine a plant leaf. This is OB’s hidden garden. 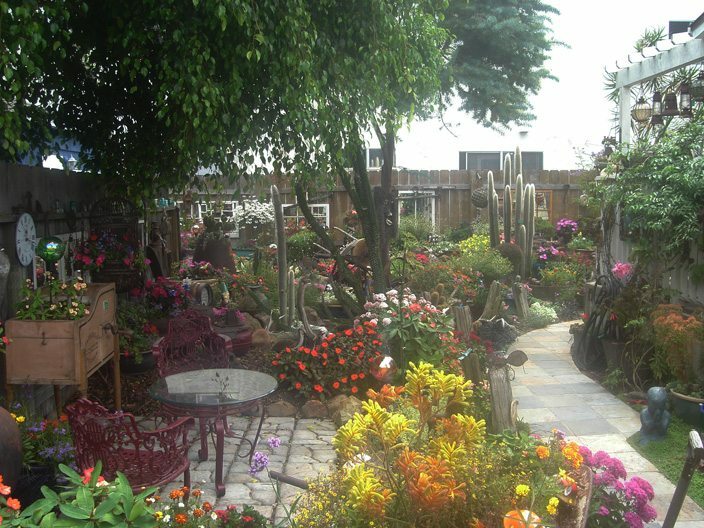 For more pics of Louie and Kathi’s garden, go here. 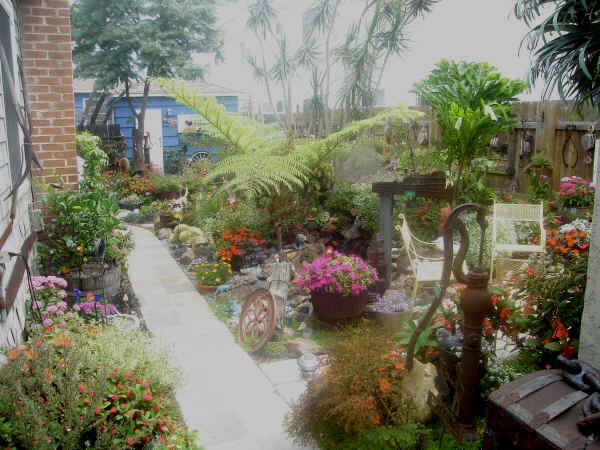 Louie and Kathi’s Hidden Garden is located next to the Blue Parrot on Niagara, between Cable and Bacon streets. Go through the pathway by the purple bench to enter, and wander at your will, or if Louie or Kathi are around, you may even get a tour. Louie’s antiques are available upon request. For more photos see the repost just previous to this one. Mary, this was so well done. I have been visiting their garden for quite some time. I love how it makes you feel miles away from the bars and the bustle of Newport. I love that there are no politics to be bothered with in their garden. Both Louie and Cathi are some of the nicest, most inviting people I’ve ever met. You really captured Louie’s character well. I knew you would do a wonderful job sharing this story with all of us. Thank you. Mary, a fine piece. You conveyed the way this garden is a metaphor for Louie and Cathi’s approach to life. They meet the world with openness. Revel in the surprises. Speak the language of beauty. I haven’t visited this garden yet, but simply reading about it refreshed my spirit. Look what is possible when we set aside our guns and knives and all that they represent and embrace the possibilities within us to create a garden instead of a battlefield. Beautifully written post about a beautifully cared for garden. i’ve met louie, not kathi, but louie is one of the friendliest guys i’ve ever met on land. when you meet him, he acts like he’s known you for years. I have been to the Garden , at the urging of a friend several months ago. What a treat a real delight !! Photos do it NO justice you must experince the beauty……nice job exposing this hidden treasure !!……. a place for obecians to rest their spirits…awesome piece Mary. You created a beautiful space here in OB. I was over there today admiring your garden and remembering what a great guy and gardener you where. 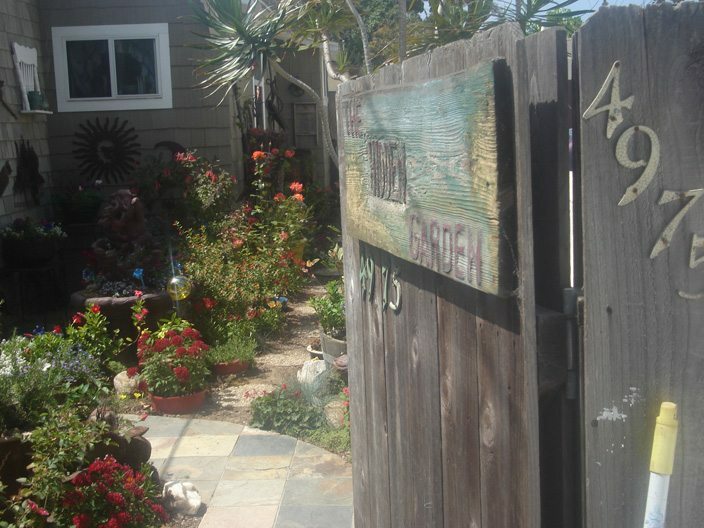 Many here in OB will never forget your Hidden Garden a special place in a special town. You my friend will be missed. Kathi our condolences to you and your family. May you find peace in the days ahead. Pat, this is awful news. Louie was such a wonderful man. I loved walking through his garden, listening to his stories and jokes. My heart goes out to Kathi. Please let us know, if there is anything we can do as a community to offer our support, as they have both given us so much joy. This is very sad. I echo Jon sentiments, let us know if there is anything we can do. I just found out about Louie’s passing this morning. Services will be this Wednesday Dec 1st 6-8 pm at Beardsley-Mitchell Funeral Home Sunset Cliffs and Narragansett ave.
That is very sad. He was a very nice man, and very gracious about sharing his joy. Condolences to Kathi. If anyone attended Lou’s memorial service, would you please let us know how it went. Yes, I WENT AND IT WAS SO LOVELY. LOTS OF PEOPLE, FLOWERS, MEMORIES, PICTURES. I SIGNED THE BOOK AND WENT TO THE CHAPEL AND SAID A PRAYER. LOUIE WAS THERE IN HIS MOST PRECIOUS URN. A QUAINT, CUTE URN. SO LOUIE. SOME ONE HAD DESIGNED AND MADE A GARDEN ON AN OLD WHEELBARROW, SO EXQUISITE, AND BOUGHT IT TO THE FUNERAL HOME. IT WAS SO NICE AS WELL AS THE NICE FUSIA PLANT THERE TOO. 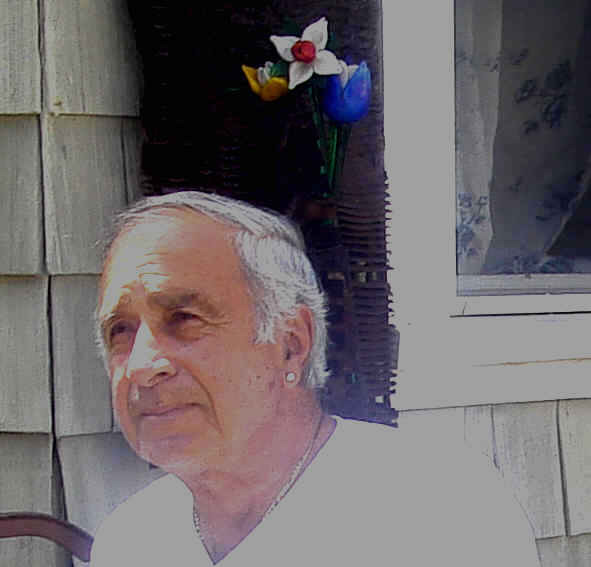 HE DROVE TO MY RECENT GARAGE SALE 3 WEEKS AGO, IN OB, AND SAID HE HAD A LUNG INFECTION. HE WAS DETERMINED TO GET OUT THOUGH. HIS PASSING IS A SHOCK AND I MISS HIM. HE HAS LEFT US ALL A GREAT LEGACY. I LEARNED A LOT FROM HIM AND KATHI KNOWS I WILL HELP HER IN THE GARDEN. WE ALL CAN KEEP HIS MEMORY ALIVE BY HELPING TO KEEP OB WITH PLANTS, FLOWERS AND NOT TRASH. LOUIE WOULD WANT THIS. LETS GET BUSY. ! Thanks so much, Andrea, for sharing. And by the way, others of us would like to help Kathi with the garden. Do you know if she needs more help and how perhaps we can help get the word out to other supportive OBcians? I would just ask Kathie how she wants it to be known. I spoke with her at the memorial and I know of a few others that have offered, but just ask her. Maybe in the future, another article in the Beacon with Kathie? Andrea – do you know Kathie well enough to ask her for us and then get back to us. Should we ask our readers? Our local OB activists? Or …? Please let us know. I never met Kathie, I did meet Louie of course. A lovely garden and lovey people. I will help anytime too. Just say the word.